Identity/Class: Extra-dimensional (Earth-238) human, magical mutate, powers enhanced by costume. Base of Operations: (currently) Otherworld. Powers/Abilities: Superhuman strength (at least class 10), invulnerability, enhanced "para-senses", flight. Powers enhanced by costume. History: (Mighty World of Marvel #13 (fb) - BTS) Linda McQuillan was granted the powers of Captain U.K. by Myrr (called Merlin in other dimensions) and Roma. She either visited or had a vision of Otherworld at this time, which she perceived as a world of minarets. She was assigned to protect her world, designated Earth-238. (Excalibur I#45 (fb) - BTS) At some point probably around this time, she attended the Captain Britain Corps training lectures on Otherworld which explained to her how her powers worked and how the multiverse was arranged. (The Daredevils #7 (fb) - BTS) - The Fury, a machine designed to slaughter superhumans was unleashed by the totalitarian regime which had taken over Britain. It is devastatingly successful, killing all who cross its path. (The Daredevils #7 (fb)) The last surviving heroes of Earth-238 had gathered together to make a stand against the Fury, the killer cyboite which had murdered so many of their kind. As they lost contact with heroes still outside, and the wall of their hideout started to crack under repeated blows from the creature, Captain U.K. clung to her husband Rick and feared that this time they were not going to win. The wall exploded inwards and the Fury came among them, making short work of Tom Rosetta, Android Andy and Miracleman, much to Captain U.K.'s distress. Colonel Tusker reassured her, pointing out that it had yet to get past his killer toys ; seconds later it incinerated him. Rick carried her to the transporter booth while the Fury continued its killing spree, and though he didn't have time to calibrate the destination properly, he set it to send her as far away as possible. Her last sight before she teleported was the Fury grabbing her husband by the throat and killing him with a blast to the chest. (Marvel Superheroes #379) During his battle with the Junkheap that Walked Like A Man, Captain Britain of Earth-616 (recently arrived on Earth-238) was informed by the armed forces that Captain U.K. disappeared a while back. (Marvel Superheroes #388) On Earth-238 the Fury killed Captain Britain while he was in the graveyard of superheroes, kneeling next to the empty grave reserved for Captain U.K. And a universe away, a woman shivered in dread, as if someone had just walked over her grave. (The Daredevils #2) The young woman, the dimensionally displaced Linda McQuillan, suffered an anxiety attack while in her bathroom. The pills she took didn't help to stem the fear or the memories, that it was still out there somewhere and would find and kill her. She grabbed a metal rail to hold herself up, and as she distorts it with her bare hand, she wishedshe wasn't so weak and helpless in the face of what was coming. (The Daredevils #7) Linda had a nightmare about the Fury's attack on the last remaining heroes of Earth-238. She vividly remembered the deaths of a number of her fellows, before her husband Rick gets her to a transport booth. As he sent her away, the last thing she saw was his death at the hands of the Fury. And then she woke up screaming. Following her nightmare Linda McQuillan got out of bed and started thinking about getting ready for work, but the headline in the morning paper caused her to collapse in a corner crying. 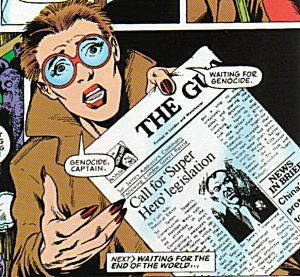 Sir James Jaspers had just called for anti-superhero legislation. The nightmare she had once escaped had caught up with her. (The Daredevils #8) Linda left the flat earlier than usual after receiving the morning paper, before it was light. And as she headed down the street, she fails to notice a cat falling victim to the still recovering Fury, which had been damaged traversing the dimensions, but was now on her trail. A little later, at Braddock Manor, Captain Britain, newly returned with the Special Executive from Saturnyne's trial, answered the front door to find Linda. She looked at the superhumans gathered in the hallway: "All these superhumans. All in one room. Just like before. Just like last time...It's begun already, hasn't it? The drawing in, the huddling together, the waiting..." She held up the paper with the headline about Jaspers, "Waiting for genocide." (The Daredevils #9) As the gathered heroes in Braddock Manor watched Sir James Jaspers' speech against superhumans on the television, Linda lost her composure and left the room. Brian Braddock noticed and followed, catching up with her as she stood at a window trying to get a grip on herself. He tried to reassure her that this was a different world with a different Jaspers, and that things didn't need to follow the same devastating course as they had on her Earth. She replied that the deaths, the screams, the blood and the burning, "all the horror, all the purges and the betrayals and the executions. And on my world it all began with one little speech"; and it was the exact same speech, word for word, as the one they had just listened to. In Otherworld Merlyn and Roma began a chess game, and Captain U.K. was one of the pieces on their board. Back on Earth Linda told Captain Britain that he faced death camps; his response is that if this was true then they needed to fight back, all of them. But Linda said she was not a superhero, and that was what she would say when they came for her. She could not face the horror again, and stating she did not know why she had come, she departed into the wintery night. In Otherworld Merlyn moved her piece into play, but wondered that something was amiss at the periphery of his vision. And back on Earth the Fury, now back at full killing strength, stepped out of the trees to confront the startled Linda. 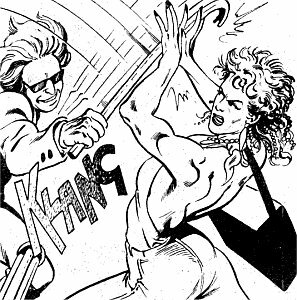 (The Daredevils #10) The Fury blasted at Linda who dodged with hysterical speed. She raced through the trees, her nightmare of the last ten years come to life. The Fury caught up with her and, grabbing her by the throat, smashed her against a tree. In Otherworld Merlyn shouted out "No!!" and moved his hands around the piece representing Captain U.K., as the Fury fired its murderous blast weapon at the hero at point blank range. Merlyn's hands and the chess board around them were scorched and aflame, but the figure they encompassed stood unharmed. Back on Earth the Fury stood in momentary confusion over the unscathed Linda McQuillan. As it moved to try again, Captain Britain, having heard the sound of the blaster, hurtled in to battle it, followed swiftly by the Special Executive. (The Daredevils #11) Linda remained on the ground, paralysed with fear, as the battle raged on around her. At its end, with the Fury temporarily defeated, Saturnyne moved to help the heroine, who was still in a near catatonic state of shock. (The Mighty World of Marvel #8) Britain elected Sir James Jaspers Prime Minister, who swiftly set up concentration camps for anyone with powers, run by the crimelord Vixen through the government agency S.T.R.I.K.E. that she secretly controlled. In London, as curfew was declared by wailing sirens, the remaining heroes, including the still unresponsive Linda McQuillan, hid out in a basement. Saturnyne told Captain Britain that they had to face Jaspers before things could get as bad as they did back on Earth-238, but he reminded her that she ran out on him on that world. She reassured him that they would all be standing behind him this time, but as he expressed scepticism at this statement she glanced past him to the oblivious Linda, who stared off into the distance, apparently unaware of the world around her. (The Mighty World of Marvel #9) Captain Britain set off to battle Jaspers, leaving the others undefended when the forces of S.T.R.I.K.E. uncovered their hideout. Tom Lennox was killed trying to buy the others time to run, and Betsy Braddock and Alison Double were captured. Saturnyne cried out to Linda to help them: "You're a superwoman! ", but Linda screamed in terror to be left alone and fled, with Saturnyne just behind her. The Majestrix caught up with the frightened heroine, and demanded she helped Captain Britain, as their last chance to avert the looming disaster. When Linda refused, Saturnyne began hitting her, calling her a coward for failing her world, her lover, and Tom Lennox. Finally Linda lashed out, sending Saturnyne flying. Stunned at what she had done, she stood looking at her fist, while Saturnyne smiled. (The Mighty World of Marvel #10) Near the distorted Trafalgar Square, while the world went insane from the Jaspers Warp, Saturnyne bullied and cajoled Linda into changing into her Captain U.K. costume. (The Mighty World of Marvel #11) Saturnyne and Captain U.K. arrived at what remained of Downing Street in time to witness the fight between the Fury and Mad Jim Jaspers. Wisely they just observed, rather than interfering. (The Mighty World of Marvel #12) As the battle between the two powers continued, Captain U.K. hid her face against Saturnyne's shoulder. Even after the Fury had killed Jaspers and badly weakened, was fighting Captain Britain, she merely watched, rigid with fear. But when it became clear that he was going to lose, and the Fury pinned him to the ground, she recalled the death of Rick, her husband, and her fear turned to rage. She flew into combat, literally ripping the Fury apart. She tore its limbs off, and ripped its spine out. Ten minutes after she had killed it, Captain Britain managed to stop her smashing up the remains any further. Finally released from the fear that had crippled her for the last decade, she and the battered Captain of Earth-616 held each other, the nightmare finally ended. Then both heroes' para-senses kick in, giving them scant warning before Roma transported them to Otherworld. (The Mighty World of Marvel #13) Brought to Otherworld to attend Merlyn's funeral following his death during the Fury and Jaspers' battle, Captain Britain, Saturnyne and Captain U.K. were presented before the gathered Corps of alternate universe counterparts to them. They watched as Merlyn's corpse was cast into the void of the Portal Perilous, then attended the wake afterwards. Roma took them outside to speak to them, explaining that Merlyn had deliberately used Linda as bait to draw the Fury to the Jaspers of Earth-616. She showed them that Earth-616 was returning to normal, with the camps being torn down, and let them see Saturnyne having her revenge on Lord Mandragon, the man who usurped her throne. Then she returned the two heroes to Earth, where they materlialised at Darkmoor, inside the same ring of standing stones where Captain Britain originally received his powers. They shared a kiss and then walked off in different directions to reclaim their lives. (Captain Britain Monthly #7) Linda McQuillan was hired to take photographs at a prison. When she arrived she was met by Agent Gabriel of the RCX, who called her Captain. When she denied knowing what he was talking about, he struck at her with a crowbar, which bent when it hit her hands. Having proven his point he and Agent Michael introduced Linda to the Warpie children RCX had been gathering up in the wake of the Jaspers Warp. They convinced her that for the safety of the children she should help them talk to Captain Britain, whom they wished to recruit to their cause. After the RCX had loaded some of the Warpies, the battle trained Cherubim, into vans, the now costumed Captain accompanied them to Braddock Manor. (Captain Britain Monthly #8) Together with Michael and Gabriel, Captain U.K. walked through the illusions the computer Mastermind generated in an attempt to to keep them from the manor. 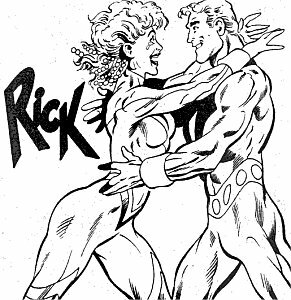 Brian and Betsy Braddock reacquainted themselves with their old ally, and then the RCX agents tried to convince Captain Britain that he should work with them to hold the country together now that it has been destabilised by aftershocks of the Jaspers Warp. Linda argued that if they were to prevent persecution and suffering they might have to sacrifice their principles and work with the shadowy agency. The debate was cut short however when the Cherubim were let loose by Meggan, a mutant who had recently moved into the mansion..
(Captain Britain Monthly #9) Captain U.K., Britain and Betsy Braddock tried to contain the superpowered children. 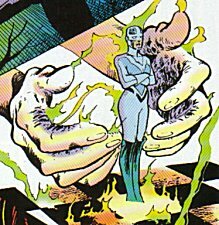 Fern of the Cherubim captured Captain U.K.'s hands with her bizarre body, but the hero threw her against the electrically powered AC-DC, shocking her into letting go. Then Lump, capable of confronting people with their greatest fears, made the mistake of using his power on the heroes. Confronted with Mad Jim Jaspers and the Fury, the heroes lashed out at full strength, with Captain U.K. smashing Lump into unconsciousness. However the last remaining members of the Cherubim, the Cherub Whirlwind, gathered the heroes up in their psychokinetic tornado, before being accidentally killed by the recently transformed Meggan. The RCX, Warpies and Captain U.K. moved into Braddock Manor. (Captain Britain Monthly #13 (fb)) Linda McQuillan watched as Agents Gabriel and Michael tried to convince Betsy Braddock to become a new Captain Britain, to replace her brother who had refused to work with RCX and then left the country. Linda explained that she intended her involvement with the organisation to be short-term only, but said that if Betsy decided to become the new Captain then she would be willing to be her partner for a few months so she could have the benefit of her experience. She got Jeeves, the butler incarnation of the Mastermind computer, to alter her costume, in particular so that the helmet no longer covers her hair. With Betsy now similarly outfitted with a booster costume, she taught her protege how to fly and helped her handle bank robbers, foiling a bullion robbery in London's West End. (Captain Britain Monthly #12) Captain Britain and Meggan returned home after several months away to witness Captain U.K. and Betsy Braddock in her Captain Britain costume flying over the manor. (Captain Britain Monthly #13 (fb)) After a couple of months of working with the new Captain Britain, Linda McQuillan decided that Betsy no longer needed her help, and left to resume her own life. (Captain Britain Monthly #14) On December 24th, around midnight, Captain U.K. was asleep among the ring of standing stones at Darkmoor. She was awakened by the arrival of Roma from Otherworld, who summoned her there. Roma asked her of her dreams, which were about the death of her husband Rick at the hands of the Fury. 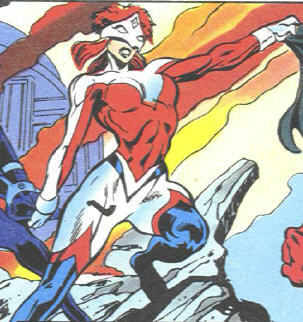 Roma explained that it was Captain U.K.'s presence on this world that had prevented the rift caused by the Jaspers Warp from healing fully, and that if they were to stop more Warpies from being born and allow things to return to normal, she would have to depart with her for Otherworld immediately. On Otherworld Roma charged her with the job of stopping the insane rampage of Opul Lun Sat-Yr-Nin, who had been slaughtering her people ever since she lost her paramour Kaptain Briton. Agreeing to take on the task, Captain U.K. was then asked by Roma to once again remember her last moments with her husband. Unwilling at first, she relented and recalled how the Fury slaughtered the heroes of her world. Rick carried her to the transport tube and placing her in it, activated it just as the Fury lunged for him. However, this time she remembers him vanishing before the cyboite could grab him. Roma explained that she has reached back in time and rescued him an instant before his death. Linda and Rick were happily reunited with one another. Transported to Earth-794 she and Rick led a successful coup to overthrow the tyrant. (Doctor Who Magazine #173) Captain U.K. was seen among the people attending Bonjaxx's Birthday party at the interdimensional port of Maruthea. (Excalibur I#45 (fb) - BTS) Now assigned to Earth-839 Linda battled the Red Monarch and helped prepare for Princess Madonna's coronation to the throne. (Excalibur I#44) When Captain Britain was put on trial in Otherworld by the Corps, Captain U.K. offered to act as his defense council. She calmed the restrained hero down and pointed out that by defending him she was risking guilt by association. Under those circumstances he agreed to co-operate, and was released from his restraints. She explained that as a member of the Corps he was charged with being a guardian of the dimensional interface between realities and with championing the highest values of his Earth's morality code. They listened to the list of charges raised against him, and then feeling that the court had made its decision before the trial began Brian released Linda from her position as defense counsel before angrily confronting the court. (Excalibur I#45) As Captain Britain attempts to fight off the rest of the gathered members of the Corps, Captain U.K. became his sole ally in the brawl. The odds against them were overwhelming, but before the fight could progress too far, it was interrupted by Saturnyne, who ordered the Corps to cease its punishment of Captain Britain on the orders of Roma. Captain U.K. escorted Captain Britain outside for some fresh air. She showed him the energy matrix which powered each member of the Corps, and explained how the matrix was strongest in the British Isles on each Earth. Away from the matrix on other parts of the Earth, the Captains required the arcane circuitry of their costumes to store the energy that powered them. She also explained about how in each world the matrix was marked in ancient times by ley lines, with the interfaces marked by rings of standing stones or monoliths or a tower built by Merlyn. Having delivered her exposition, she used an interface to return to her world, stating she had three days to recover the crown jewels that the Red Monarch had stolen again before Princess Madonna's coronation. (Excalibur I#124) - Linda returned to Earth-616 to participate in the shower and bachelorette party of Meggan. In the process, she helped fight off another assault by the ever-confused Crazy Gang, this time led by Feron, as the Executioner. 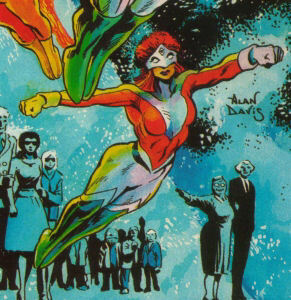 (Excalibur I#125) - Linda attended the wedding of Meggan and Brian Braddock. (Fantastic Four III#8) Linda appeared to be one of the Corps members who attempted to retrieve Frankling Richards, and came into conflict with the Fantastic Four as a result . (Excalibur II#1 (fb)) When an army of unknown origins attacked Otherworld, apparently at the behest of Roma, Captain U.K. was one of many members of the Corps who rushed to that dimension's defence. She was one of the few who survived the onslaught, but with the Corps decimated, she escaped to Earth-616 to recruit the aid of Captain Britain. (Excalibur II#1) Captain U.K. crashed through the ceiling of the Darkmoor Research Centre where Captain Britain was working, having just lost a fight to several of Roma's hunters. After the hunters were driven off by the combined forces of the heroes at the Centre (Psylocke, Meggan and the Black Knight) they checked on the stricken Captain U.K., who brought them up-to-date on the events in Otherworld. Using some of the centre's cutting edge technology, Brian generated a wormhole to take them all to Otherworld in the hope they could set things right. (Excalibur II#2) Captain U.K. saved Crusader X from death at the hands of the Roma's forces. She was too late to save the vast majority of the Corps, who had been slaughtered. She then joined forces with Meggan, Psylocke, the Black Knight, Crusader X, and Psylocke in fighting off another assault by the enemy. (Excalibur II#3) Along with Meggan, Psylocke, the Black Knight and Crusader X, Captain U.K. broke into Roma's castle and witnessed her addressing her troops, telling them of her plans to conquer the cosmos. But they soon discovered the real Roma was being held captive in the citadel. Before they could free her they were confronted by the fake Roma's troops, who revealed themselves to be the Warpies (and specifically in this case the Cherubim). Caught off guard, the heroes were soon defeated. (Excalibur II#4) The fake Roma had revealed himself to be the computer Mastermind in disguise. With all the heroes now captive, he planned a public execution, starting with Captain Britain. But the heroes broke free using Psylocke's new telekinetic powers, which Mastermind was unaware of, and battle was joined with the Warpie army. While Crusader X desired vengeance for their fallen comrades in the Corps, Captain U.K. recognised the wrong that had been done to the Warpie children too. Afteren Roma and Captain Britain defeated Mastermind, and the latter hadgained the ability to turn the Warpies back into normal humans, it was her attitude rather than Crusader X's which prevails. 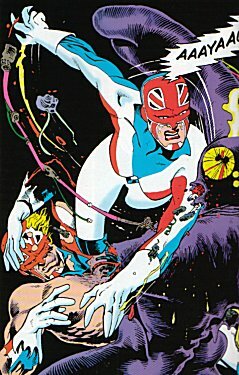 In Marvel Superheroes #379 the soldier Captain Britain talks to refers to Captain U.K. as a "he". There are several possibilities why this might be the case: he might simply have mis-spoken; it might have been the case that Linda McQuillan operated mainly in secret, so that the majority of the public thought the hero was a man (seems unlikely given her figure and a skin-tight costume, but you never know); or perhaps there was another Captain U.K. that she either replaced shortly before the Fury's purge of superhumans, or who took her place afterwards. Mikel Midnight suggests on his site (timeline238.html) that perhaps "The Status Crew briefly employs a male actor who takes the name Captain UK to act as a patriotic front man and denounce the other heroes." before he is killed by the heroes. I think it's more likely that Linda replaced someone else - we have enough precedent of this happening in the Captain Britain Corps, and it would explain why she hangs back during the final fight with the Fury if she is relatively inexperienced and the cyboite had perhaps already killed the previous person to hold her title. Per Degaton points out that "Although not canonical, Steve Roman's Chaos Engine trilogy of X-Men prose novels also used Captain U.K., with many references to Roma, et al. Roman even remembered to throw in an implied appearance by the Doctor from Doctor Who"
The eagle-eyed Per Degaton also spotted someone who looks a lot like Captain UK among the members of the Corps who took on the FF in an attempt to capture Franklin Richards. I've listed this appearance in the history, but it is unconfirmed that it is definitely her, as she wasn't named, and a lot of the Corps look very much alike. Captain U.K. informs the Captain Britain Corps Court in Excalibur I #44 that she is assigned to Earth-839. Later, in Excalibur I #56, Captain Britain mentions that Sat-Yr-9 comes from Earth-794. This was the world that Linda was sent to at the end of Captain Britain Monthly #14. ASSuming that Captain Britain didn't simply get the designation of Sat-Yr-9's world wrong, this would mean that Linda was reassigned to yet another world after deposing the aforementioned tyrant. I speculate that having lost her own reality, maybe she is not permanently assigned to any one Earth - every other Captain refers to themselves as "Captain whatever, planet number", not "Captain whatever assigned to Earth number" Roma couldn't leave Captain UK on Earth-616 because she was an anomaly, preventing that dimension from fully healing. Perhaps her exposure to two lots of Jaspers' Warp has left her "radioactive" (for want of a better word), and she cannot stay in one dimension too long without causing harm to the fabric of that reality. Or there might be another reason. Whatever the cause, it looks like she serves as a temporary replacement for realities which have lost their own Corps representative, until a new permanent one can be assigned. 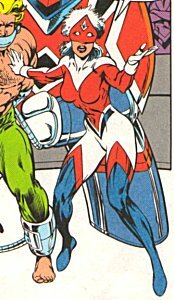 A great character who develops and grows very believably in her Alan Moore storyline, she has been rarely seen and vastly underused ever since Captain Britain fell into the hands of American writers. Much like Captain Britain himself.